1. In a large bowl, add sliced mango pulp, salt and crushed jaggery. Keep aside for 2-3 hours to marinate. 2. Heat oil in a wok. Add all the spices and gently roast them. Add the marinated mango pulp and cook covered till tender and all spices are evenly distributed. Cool down completely and store in an air-tight container in refrigerator. It stores well for few weeks. I have not added any preservative and simply refrigerated. But if you intend to make a bigger batch and use over a longer period of time, then I suggest adding soda benzoate to preserve. 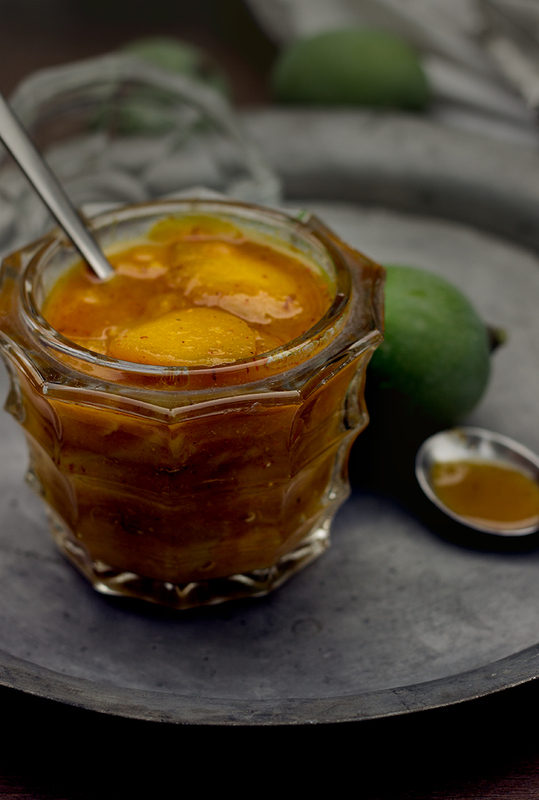 It is best to let the mango pulp marinate for 2-3 hours with salt and jaggery, it lends an amazing flavour and shorten the work further of cooking. If you do not get a chance to marinate then also it is OK to add salt, jagerry and all other spices together at the time of cooking. You may need to add little water to the pulp while cooking if the pulp is not marinated. You may need to adjust jaggery as per the sweetness required. You can add more flavour my adding dried mint leaves in the pulp while cooking.